When designing jewelry my favorite semi-precious stones are Sea Sediment Jasper, Aquamarine, Alexandrite and Jade. But each time I shop for beads for my handmade original earrings, bracelets and necklaces I find more semi-precious gemstones that I thought I could never afford and I pass them on to my customers. Recently I’ve purchased Dragon Veins Agate, Ruby, Turquoise and Aragonite. Did you know Dragon Veins Agate heightens creative visualization? It strengthens our ability to manifest our destiny, stimulates creativity, courage and harmony as it balances our emotional and physical body. Meanwhile the pattern variations in each stone make beautiful bracelet, necklace and earring designs. 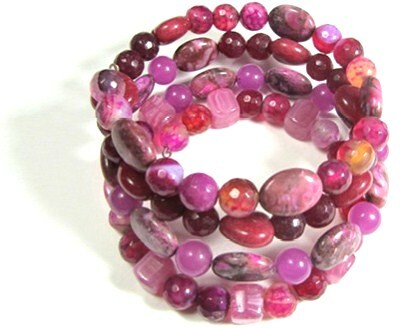 Deep red Rubies are stunning in bracelets, earrings and necklaces too. A Ruby is a commitment stone that opens the heart to a love that doesn’t waver. Rubies also give courage, attract friendships, promote self love, stimulate creativity, dispel sadness and increase concentration. Looking for love? Wear a stunning layered Turquoise necklace on your next date. Turquoise stimulates the initiation of romantic love and promotes spontaneity. Turquoise is also a strengthening stone. Turquoise tempers excesses, relieves stress and neutralizes extremes while bringing wisdom, understanding, trust and kindness. Turquoise is good for forgiveness, acceptance and releasing old regrets as Turquoise induces a sense of serenity providing hope, discovery and balance. Need to chill out? Wear a bracelet with Aragonite. Aragonite is wonderful for deep peaceful meditations and it also uplifts. Aragonite is a grounding stone, it stabilizes your connection with the earth and brings energy through your entire body. This stone offers one a clear overview and helps us navigate business and personal challenges with a clear head. Metaphysically is it said to boost self-confidence while diminishing anger and stress. ﻿﻿﻿Sea Sediment Jasper is a powerful protector and gives supports in times of stress. Wear a bracelet with Sea Sediment Jasper to bring inner peace, clarity, love and compassion into your life. Its also good for dream recall and has a lovely patterned surface. Aquamarine is a meditation stone that quiets the mind. This is the stone of courage, tranquility, openness, creativity, communication, self-awareness, confidence and purpose. With so many benefits, I just had to add this stone to my bracelet as well. Jasper nurtures and protects. Most effective when used over time. Jasper provides the courage to tackle problems. Wear Jasper jewelry for quick-thinking, to stimulate the imagination and transform ideas into reality. Alexandrite boosts self-esteem. This gem brings positive change, happiness and success. Intensifies love, compassion and sensuality, Alexandrite is found in beautiful and unique jewelry designs. Jade is an ancient stone that attracts love. It’s beneficial to the heart in the physical and spiritual sense. Jade also assists in clear thinking and brings money into your life. Use for courage, wisdom, justice, mercy, emotional balance, stamina, humility, generosity, peace and harmony. Combine Jade with other beads for bold colorful bracelets and necklaces. With colorful jewelry you can feel bold, happy, mysterious, calm, refreshed and many other positive uplifting emotions and traits. Wear colorful earrings, bracelets and necklaces to complete your transformation to get the outcome you want. For instance when you wear a red bracelet you'll be confident and take on situations you wouldn’t before. You'll surprise everyone with your ingenious ideas as red is the best color for creativity. Red is brave, attention-grabbing, fiery, dynamic, vibrant and provoking. If you want to be exciting, strong, determined, passionate and courageous wear red accessories. It's a bold energy and people will be either drawn to you or move out of your way. Meanwhile wearing charming pink earrings will make you more gentle and sweet, because pink is loving, nurturing, affectionate, heartfelt and tender. It’s also thoughtful, kind and highly intuitive. Brighter shades show your youthfulness, confidence and fun spirit. Purple is mysterious, noble, elegant, sophisticated, magical, selfless, transformative, wise and enlightened. It’s pure and compassionate love. Violet is mostly suggested for meditation, deep sleep, spirituality and psychic energy. 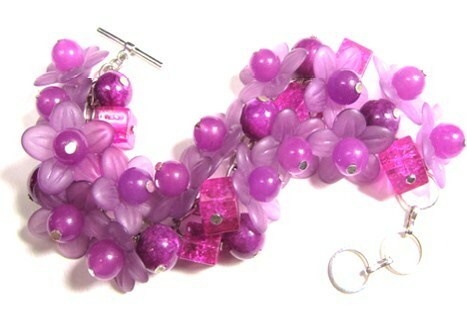 So try violet earrings or a necklace to stimulate your subconscious. Dark purple represents luxury, imagination and introspection. Lavender is sensual, romantic and creative. Yellow is lively, optimistic, intelligent, happy, energetic, joyful, idealistic, imaginative, hopeful, sunny and creative. With yellow you get mental clarity and cheerfulness. If you wear bright yellow earrings, you’re a happy-go-lucky person. Lighter yellow in a necklace will make you feel fresh and joyful. It stimulates an overall sense of optimism, hope and balance. Blue is peaceful, loyal, honorable, trustworthy, deep, stable, harmonious, unifying, faithful, inspiring and confident. Blue is tranquil and also intuitive. Light blue has a calming effect and feeling of freedom. Royal blue represents nobility, superiority, and richness. Wear dark blue earrings to show your knowledge, intelligence, expertise, logic, dependability, authority, professionalism, integrity, and sincerity. An aquamarine blue bracelet is great for ideas.